We all live and work in an urban environment. Oftentimes, we are not aware of how hugely our behavior is influenced by the environment. For example, if stairs are inconveniently located, we take an elevator. If bicycle lanes are dangerous, we prefer to drive a car. Future cities will alter human behavior in countless ways. Persuasive urban systems will play an important role in making cities more livable and resource-efficient by addressing current environmental problems and enabling healthier routines. In this course, we will work on reshaping our current environments and designing future spaces to help people become healthier and to acquire sustainable lifestyles. 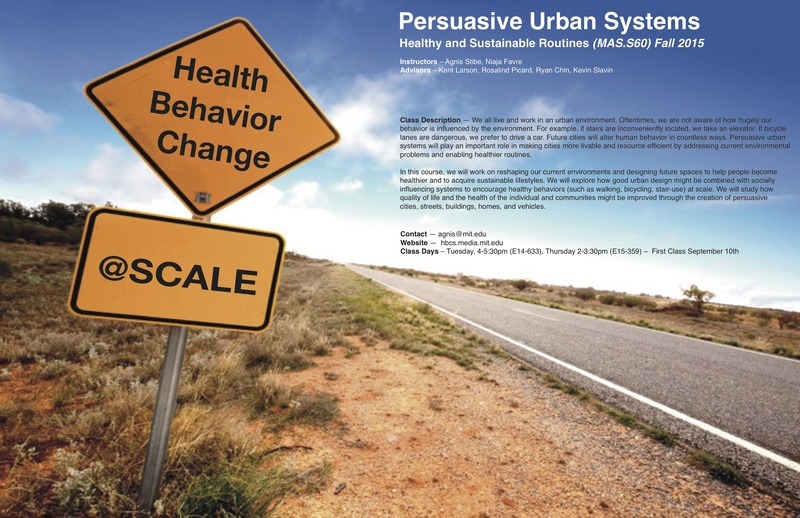 We will explore how good urban design might be combined with socially influencing systems to encourage healthy behaviors (such as walking, bicycling, stair-use) at scale. We will study how quality of life and the health of the individual and communities might be improved through the creation of persuasive cities, streets, buildings, homes, and vehicles.